It has been very busy at countrynmore.com, so I have neglected posting on my blog. I need 10 of me. I have been busy with my oldest son and doctors. My son injured his knee on a biology trip. An MRI was done just before Thanksgiving. While on a biology trip to Long Beach, he was down on the rocks collecting data, while the other students were up and away from the water. The students were to warn my son when a wave was coming, so that my son could get out of the way. Well, they forgot and my son fell and wedged his knee between some large boulders. The doctor ordered physical therapy, and it is during physical therapy that my son's knee gave out on him as the ball rack helped to break his fall. He is now wearing a knee brace. It turns out that my son has a tear on his minicus and a possible tear on his main tendon. As you know, I do not live in the country, so why then is my website called countrynmore? Well, when I did craft shows, the shows were located out in the country. I did the show at Hillsidefarms (www.hillsidefarm.org) in Norco, California for about 11 years, which was out in horse country. While some people wanted country theme aprons, others liked other themes as well. It was actually my husband who came up with the name countrynmore, to signify that we made country theme items, but other themes as well. We stopped doing craft shows over a year ago. I honestly miss doing the shows, but setting up our booth was too much for the family, and made for some stressful times. When I started doing the show at Hillside Farms, my oldest son was about 11 years old. Times have changed and the boys are all grown up. The booth in itself was hard to set up and that caused the most stress. I finally told my husband and sons that if they helped with setting up all of the heavy grids (weighing over 600 total for all of the grids) that if they helped me set up the grids and canopy, that I would do the rest myself. Now, the things I will miss most this holiday show season are the long visits with Bob and Karlene (promoters). I would spend the weekend at their place in my motor home, and would help with packaging up the ginger and chocolate cookies (to die for). Every year volunteers would help Bob and Karlene make, package, and sell the cookies. The profits would help benefit the mentally challenged, and other community organizations. I have heard that they can sell up around 70,000 total cookies in one year (May, Nov. & Dec. shows). Of course, I will miss the customers, friends, and fellow crafters. Here is our new Etsy store. You will find some of our grocery bag holders. This is great if you only need one grocery bag holder. 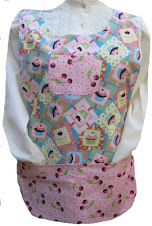 We also have some of our country waist aprons in the store as well, as well as fabric panels, and even neck coolers. It has been well over a week since I found out that I had pneumonia. Life and health are getting much better. I think one of the hardest things was that I was told that I couldn't sleep in my bed unless I was in an upright sitting position. I am so used to sleeping flat and I can't recall the last time that I had to sleep in an upright position. Thankfully, we had one of the chairs from my father-in-law. Both my father-in-law and my mother-in-law were elderly and needed one of those electric chairs that would help them get out of the chair. The chair almost put them in an upright position, but then they could also recline in the chair as well. It is so nice to be able to sleep in my own bed once again. It seemed that whenever I would lay down flat, the coughing would begin, but would finally stop when in a sitting position. Yes, it is so good to be getting better. I look forward to getting my energy back. It is still tiring just to do the simple things, and while I wait to completely healed, the normal things that are done on a regular basis are waiting for me to get better as well. Well, I have nothing but time on my hands, since we think that all of the family members have bronchitis. While the other members of the family can sleep, I am finding it difficult to do so. With only about 10 hours of sleep since Sunday night, and restless nights, the body longs for those nights where it can rest once again. I have chalked up tonight to be another sleepless night and I have decided that it is time to see a doctor. Well, dh decided to take me to urgent care. Prelimary tests show that it isn't bronchitis, but pneumonia. My four hour ordeal resulted in being poked 4 times because the my veins collapsed the first 3 times as a result of being dehydrated, two IV's, and a Breathalyzer. Well, I have nothing but time on my hands, so why not give blogging a try.